Our recent vacation in Italy reminded me of how the Europeans--in comparison to us Americans--tend to live "smaller." Now, by "smaller" I'm speaking merely volume-wise: their cars and roads are smaller, so too are their living spaces, appliances, and meal-portions. Even their coffee! How often did I frequent Italian coffee bars and order a "coffee", knowing full well that what I'd receive was a single shot of espresso, a concentrated dose of sheer coffee goodness called a "ristretto". This was no giant mug o' coffee, American style, but a taste of pure roasted loveliness. Quality--lovely, wonderful, tantalizingly tiny--quality; not quantity. In America, with its giant expanses (fly over portions of the West and you're still stunned by the immensity of our land), its citizenly corpulence, its buy-one-get-one-free mentality, and, above all, its super-sizing of food and drink, you realize how much the bigger-is-better mindset rules. If something's good in and of itself, it can only be better in greater volume, right? Right?! Or if something's average, just give me twice as much and it will get better, right? Right?! The Europeans' take on pleasure doesn't seem to run along these lines. There's still a respectful restraint, a quality of life, a "dolce vita" that doesn't demand super-sizing in order to be fulfilling. It's wonderful and challenging, for this American, at least, to take to heart. And, interestingly enough, this European respect for smallness reminds me of much biblical teaching on gluttony. Proverbs' wisdom warns against indiscriminate socializing with those who know no restraint in their eating and drinking habits. Presumably, those who do not have these appetites under control will lack self-discipline in other areas as well. It's been interesting to me to see the devolution of "sin" language in our secular culture. Too often such language limits itself in popular parlance to desserts: "sinfully delicious" or "temptingly rich." But there's a vestige of wisdom and biblical morality here: over-the-top indulgence in rich foods is a form of gluttony, one of the classic seven deadly sins. What's needed is proper restraint, a "ristretto" approach to life that values God's good gifts in moderation, gives thanks for tastes of life's goodness without a need to super-size them. "As [Ransom] let the empty gourd fall from his hand and was about to pluck a second one, it came into his head that he was now neither hungry nor thirsty. And yet to repeat a pleasure so intense and almost so spiritual seemed an obvious thing to do. His reason, or what we commonly take to be reason in our own world, was all in favor of tasting the miracle again...all seemed to commend the action. Yet something seemed opposed to this 'reason'. It is difficult to suppose that this opposition came from desire, for what desire would turn from so much deliciousness? But for whatever cause, it appeared to him better not to taste again. Perhaps the experience had been so complete that repetition would be a vulgarity--like asking to hear the same symphony twice in a day." Travel in Europe and Lewis' Perelandra remind us of the wisdom of restraint, of biblical contentment. Yes, we're meant to enjoy God's good gifts, but in moderation. 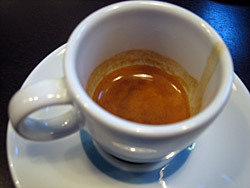 "Ristretto" is a word not just for espresso, but for life. You see, sometimes less is better. I. Love. This. Post. "Citizenly corpulence" -- ouch! ditto on "citizenly corpulence". @mitali, i hear you met cory doctorow, cool! you've hit on one of my favorite things about Europe, Carl. (Gelato portions--perfect!). And thanks for sharing the Perelandra quote, too. Wasn't that an intriguing trilogy? Ah, gelato, now there's material for a separate blog post, maybe even a series! I miss gelato. Where can I get something close in Boulder? My Economics major would define this as the law of diminishing returns. Less is more. And, yes, this is one of the many things I like about Europe. Gelato, espresso, and something Karen's daughter turned me onto... creme fraische. I stumbled across your blog entry here recently, while I was googling for some material on Perelandra. Thought of it again last night while out with some Italian friends who are living here in the Five College area (western MA. We spoke of appetite, restraint, American food, etc. I shared this 'ristretto' entry with them. Nice reflection - thanks! Some Flavors From "A Taste of Italy"